Bomb-related material has been found during raids in Barcelona which led to the arrest of 14 people suspected of links with an Islamist terror network. 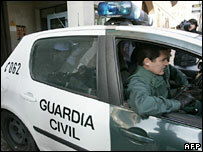 Spanish Interior Minister Alfredo Perez Rubalcaba said the suspects included 12 from Pakistan and two from India. Local media reports that the Spanish intelligence agency had warned France, the UK and Portugal that a terror cell was preparing an imminent attack. This coincides with a European tour by Pakistan's President Pervez Musharraf. The Civil Guard detained the suspects in Barcelona as part of a joint operation with Spain's National Intelligence Centre (CNI). 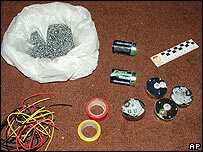 Several premises were searched and officers seized computers and materials to produce explosives. The operation is ongoing and more arrests have not been ruled out. Mr Rubalcaba said the evidence suggested that they were faced with "a radical Islamist group with a significant level of organisation which seems to have taken a step beyond ideological radicalisation". He said the group appeared to have been "planning to equip itself with material to make explosives and so to carry out violent actions". Spain suffered at the hands of Islamist militants in 2004 when 191 people were killed in the Madrid train bombings. Most of the 21 people convicted of the attacks were found to have been part of a local Islamist militant group inspired by al-Qaeda, but not part of that organisation. Spanish Prime Minister Jose Luis Rodriguez Zapatero said that it was too early to arrive at any conclusions as to what the suspects might have been planning. "Let's be as cautious as is advisable in these cases, with regard to the scope, intentions and what this potential group of radical Islamist activists represented," he said. The BBC's Steve Kingstone, in Madrid, says domestic security will be a key issue in the run-up to Spain's general election, in two months time. The governing Socialist Party says that, during its four-year term of office, 300 Islamist militants have been arrested.